Whether you're looking for fun cufflinks or serious cufflinks, cufflink designs can run the gamut if you know where to find them. From beautifully designed cufflinks as a special gift, to cufflinks that feature your favorite professional sports team, and everything in between, there are thousands of cufflink options for you to choose from. Unfortunately, you won't find much variety in cufflink designs at your local retail store. Most local shops provide a very small number of cufflink designs, and most of them are typically bland and unimpressive. If you want your cufflinks to reflect your own personal style, finding the perfect cufflinks can be a challenge. Cufflinks House offers a large selection of cufflinks and many other men's accessories as well, including money clips, key rings, tie clips and business card holders. Their website is not as professional as those companies higher ranked but they offer an easy 30 day return policy. That's why many people have turned to the internet for their cufflink needs. There are several cufflink stores that specialize in this area. They can offer you thousands of cufflink styles to choose from, while shopping in the comfort of your own home. Selection. You'll want to be able to shop from a wide selection of cufflinks in different colors, metals, designs and prices. Return Policy. If you aren't satisfied with your online cufflink purchase you need to be able to return them for your money back. Price. Paying a fair price for any product is important. A worthy company will provide quality cufflinks at a fair price as compared to the competition. 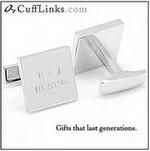 TopConsumerReviews.com has reviewed and ranked the best cufflink stores available today. We hope these reviews help you find that perfect pair of cufflinks to meet your needs!